There is no denying that Virtual Reality is a stunning and innovative technology but it is still in it's relative infancy and the games that use VR are taking some time to develop into full experience. 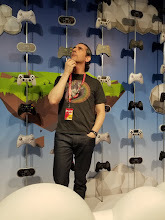 I had a chance to head to an event hosted by Oculus during PAX East to check out some of the true killer games coming out for the Oculus Rift. Virtual Reality for those not entirely familiar is enabled by a special headset, tracking device and controllers available in an Oculus Rift Kit. These all connect to your PC and allow you to experience true immersive 360 degree experiences. The Oculus Rift Kit when fully integrate enables head and position tracking (so the games/experiences know where you are looking and positioned) as well as the ability to move around game spaces with twin controllers. Once you are strapped in the experiences are truly mind blowing and offer a true new dimension to the gaming experience. The first game I tried was a true stunning example of what Virtual Reality can offer called Vox Machinae. In this game I was playing the role of a mech pilot in a fully realized giant rumbling combat vehicle called a Grinder or GDR. When the game booted up I was treated to a full 360 view of the inside of the cockpit with tech to control the GDR all around me. With the Oculus touch controllers I could actually grab consoles and move them, active my GDRs engines and gear shift upwards to new speeds and take the control stick to move the massive mech. Once I got the hang of navigation and weapons I was dropped into a 16 person all out team deathmatch and that was when the intensity ramped up. The controls where VERY visceral and while it seemed initially simple it turned out to be a little daunting as I started to move around, track enemies and fire my weapons. Because the cockpit is realized as a real place I needed to really keep on top of my gauges, speed, targets, navigation and weapons as I took out and evaded enemies. Before long things started to feel more natural and I got the hang of throttling up and down, thrust jumping out of the way of enemies and in the three rounds we played my teams were in first place each time which was a great thrill as I played through the matches. Vox Machinae is truly stunning visually but what I really enjoyed was how the environment and controls really made me feel like I was controlling this GDR. When battles got tense my palms were sweating and I was desperate to get away and regroup. I have plenty of mech games (and a few others in VR) and this was the most immersive experience by far I have ever tried. Another shooter I got to experience at the event was a really fast paced scifi game called Space Junkies. This game was really cool and initially daunting as the character I played had full 360 degree range of motion with equipped jet packs. As I started exploring the game and tutorials I was taught how to navigate up, down and quickly turn directions to follow targets effectively. The game also allows dual handed weapons that you grip using the touch controllers. Once the controls felt natural it was time to play other players in a team match and the action quickly got intense and fast paced. In the previous game I tried, Vox Machinae, the action is measured and deliberate, Space Junkies is the opposite with fast actions and battles that were a blast to experience. Quickly tracking around to follow an enemy, accelerating behind cover and choosing the right weapons make a huge difference as I tried to take out other players. The weapons were really cool to try out as some required both hands to operate and add a really visceral feel to the combat. Shotguns had to be pumped, rail guns gripped and loaded with both hands and pistols that need to be shaked to reload added a cool aspect to the run and gun strategy. The game is bright and vibrant with a true sci-fi/Tron feel that I found really interesting to experience in VR. Navigating was especially cool as I zipped around bases and space exteriors with full range and view and control over where I looked and went. It was a great experience and incredibly fun to play through.